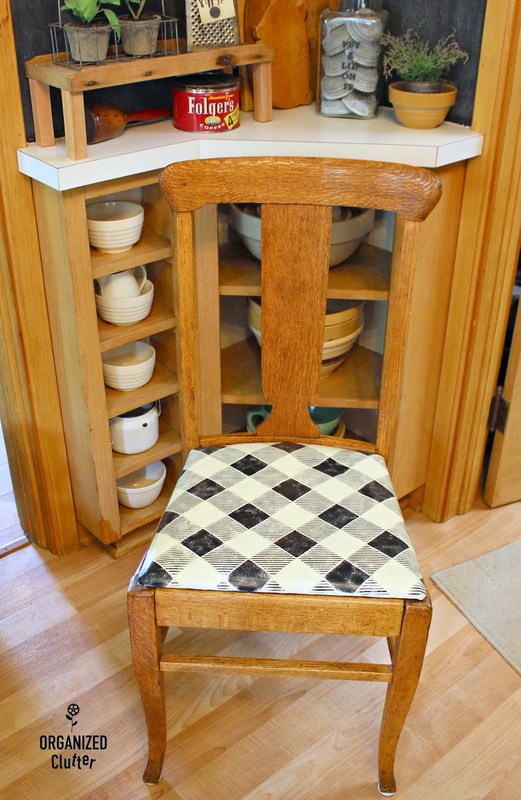 My kitchen dining chairs are vintage, and mismatched. I think I paid about $5 each for the four of them from rummage or estate sales. All four of them were oak, and all four of them had leather seats that I re-covered with burgundy vinyl. 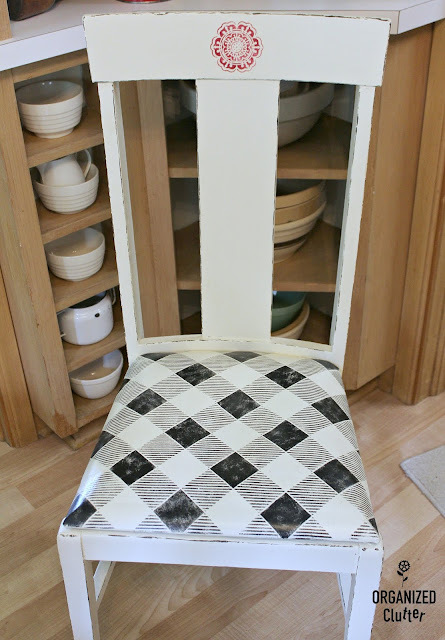 When I covered the seats with vinyl, I also painted two of the chairs black. 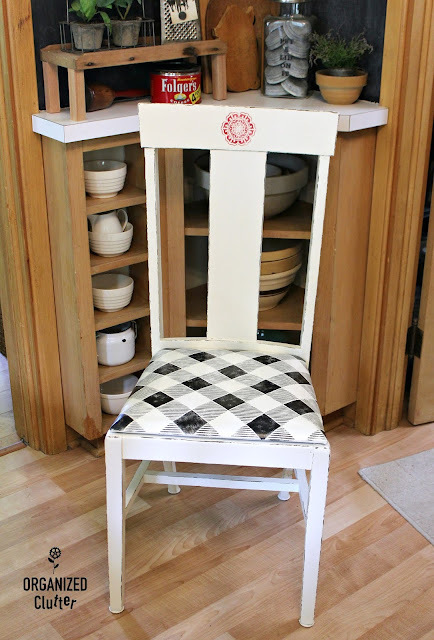 When I was tired of black in my kitchen, I painted the burgundy vinyl with Annie Sloan Chalk Paint in Old White. 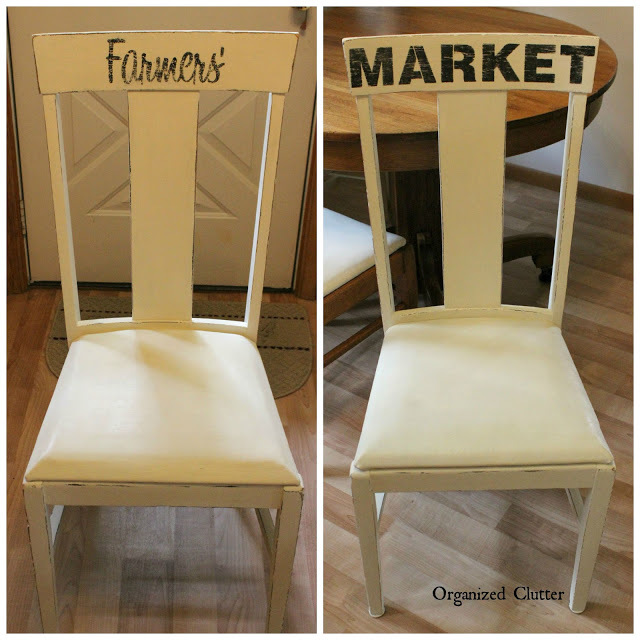 So two chairs were oak with Annie Sloan Chalk Paint in Old White seats, and two were totally painted with Old White, and stenciled with *Old Sign Stencils Farmers Market Stencil. I used Annie Sloan Clear Wax to seal the chairs and seats, and while the paint held up for the most part, occasionally dark blue denim jeans would leave blue on the seats. Since I didn't have any ASCP in Old White on hand, I used Rust-Oleum Chalked Paint in Chiffon Cream lightened or whitened with Rust-Oleum Chalked Paint in Linen White , about 5:1 ratio. I did this because Old White is a little whiter than Chiffon Cream. 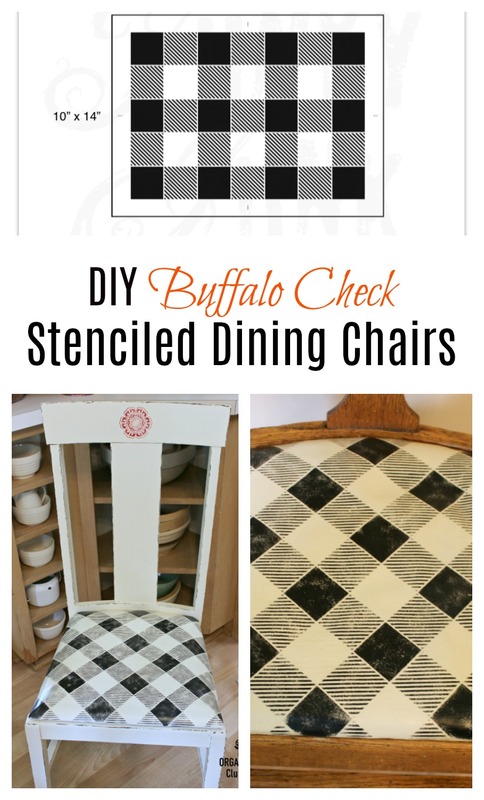 I then pulled out my *Old Sign Stencils Buffalo Check Stencil. 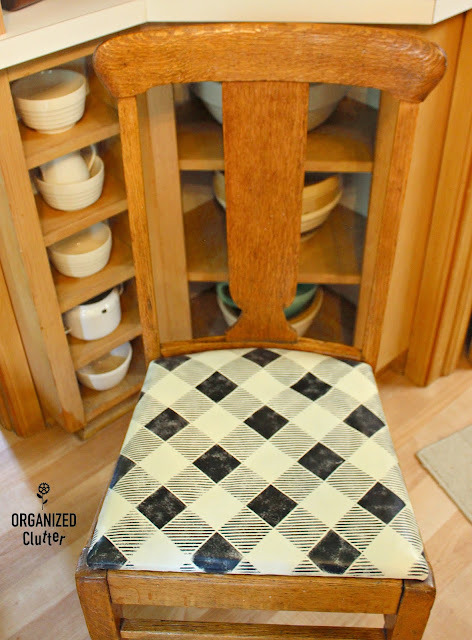 I laid it on the seats on a bias, and stenciled it with Ceramcoat black craft paint. Recently, I received **Dixie Belle Paint Company Gator Hide, a tough polycrylic sealer. **Dixie Belle Paint Company provided me with complimentary samples. I applied THREE thin coats as indicated by the directions! 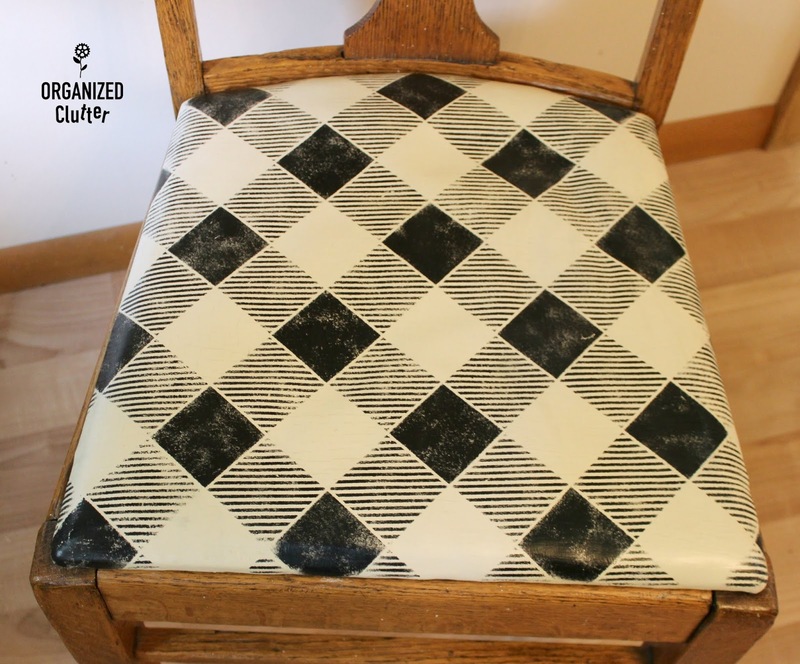 I think this product will make the seats much easier to wipe off now with a damp cloth, and I love the look. The seats look like they are covered with vintage oil cloth. So two chairs are oak with buffalo check seats. I love the this look. And, the other two chairs were re-painted with the Rustoleum Chalked Paint mixture of Chiffon Cream and Linen White. Across the top back, I stenciled on a BOHO flower with a new stencil from Hobby Lobby and Deco Art Americana Chalky Finish Paint in Rouge . I sealed the seats with Dixie Belle Gator Hide and the wood with Rust-Oleum Varathane Water-Based Satin Finish Polyurethane . I just can't get enough buffalo checks! Update**** I ended up painting over the boho flower on the top of the chairs. They had enough going on with the buffalo checks. These chair seats will match my flour sack stenciled valances. 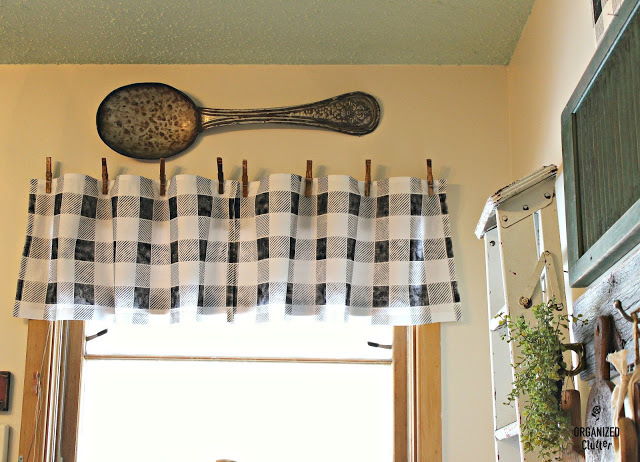 That does remind me of oil cloth...how fun!